After several long months, the engine fiasco is finally over. We couldn't have asked for a nicer guy/company to rebuild the 261, and he even came over to help light 'her up! All that's left to do is put on the driver's side door, put the hood back on, weld the new differential into place, put on the brake lines, hook up the parking brake, attach the master cylinder and then install a new drive shaft - but not in that order. Spring Green is here and no not the grass and tender leaves, I’m talking about an engine. Yes, after much anxiety, dubious individuals and patience testing, we finally have the engine, *ta-da! * The local rebuild guys were fantastic and have actually asked if they could come over and be present when TD starts it; that's service! The original 216 engine (of course) came with a water pump. When we realized we had to rebuild the engine we opted to go for a 235 engine instead. The 235 fiasco (from previous posts) turned out to be a 261 (the guy was a crook and stupid) and came with its own water pump. This 261 engine acquisition and rebuild has been quite an experience and makes for a good story. When the engine overhaul finally happened for the 261 we couldn’t be happier. 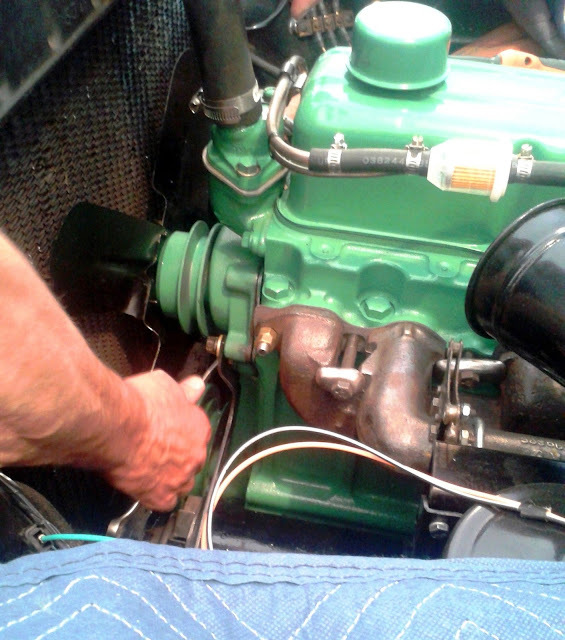 We could have used the old 216 water pump right off the bat, but since the entire 261 was being done, TD opted to use the pump that came with that engine so he cleaned it up, primed and painted it. With the engine finally dropped in and things hooked up, antifreeze was poured into the radiator and we immediately heard dripping. A look below showed us the leak was substantial and the water pump needed to be taken off. Diagnosis: the seal was bad so the pump would need to be rebuilt. The cost of a rebuilt water pump was just about even with the cost of buying a new one so a new one was purchased. The arrival of this meant TD once again primed and painted the new pump and installed it. This time the leak was at the gasket and TD saw that it didn’t seem to be sealing well. He thought one bolt on the left side might be too long and bottoming out so changed it for a shorter one but there was little difference in the leak. He had no choice but to take the water pump off again and check for other issues. Checking for surface flatness across the sealing surface, he found a 1/16th inch dip (concave) on a section of the pump face plate. This was never going to seal without gobs of gasket cement. TD took the old 216 water pump out of the parts box and checked the surface. It was flat and smooth. (This says wonders about the old manufactured parts compared to today.) He vented his frustration by grinding it clean, priming and painting it. It is important to note this is the THIRD water pump he’s painted. In the back of his mind he still wondered if the leak was due to a possible crack inside the water jacket which would allow seepage out the bolt hole. Just to be safe, he coated the bolts with gasket cement to preclude any issues of bolt-hole-leakage. This water pump is also known as a $@dam*$! Piece of Sh&*! The old 216 pump was reinstalled and rested overnight to make sure the gasket cement on the bolts cured. TD must have been thinking about this all night because the first thing in the morning I found him in the garage standing inside Abbey's bumper at the radiator with the antifreeze bucket in his hands. It should ALSO be noted he was still in his bathrobe and slippers. Like a kid at Christmas, he was eager to get going. The bucket contents once again poured into the radiator and we stood stock still and waited. Nothing. No drips. An hour later - no drips. The only thing left to do is call our friend at the rebuild shop and tell him it’s time to lite it up! It’s been a long time coming. Next up the differential, and soon enough a drive around town.